John McCain - the celebrated war hero who became a six-term Republican Senator and Presidential nominee has died at the age of 81. The Arizona representative, one of the most influential US politicians of his generation, died following a battle with an aggressive form of brain cancer. McCain became known as a political maverick willing to stick to his conservative ideals rather than follow party leaders, gaining a reputation for reaching across the political aisle and trying to work with Democrats. Before beginning a 35-year career in Congress, he served as a pilot in the US Navy, enduring a six-year spell in a Prisoner Of War camp after he was shot down during the Vietnam War. In the final months of his life, the ailing Senator proved a thorn in the side of Donald Trump, with whom he had clashed in the past, ending the President’s attempt to scrap Obamacare. In one of his final significant acts as a Senator, McCain voted in 2017 against a new Healthcare Bill dooming it with a dramatic thumbs-down on the Senate floor. Following his father and grandfather, who both became four-star Admirals, into the forces, he enrolled in the United States Naval Academy in Annapolis, Maryland. He served as a pilot based on various aircraft carriers during in the Vietnam War, before he was captured after being shot down on a bombing mission over Hanoi in October 1967. 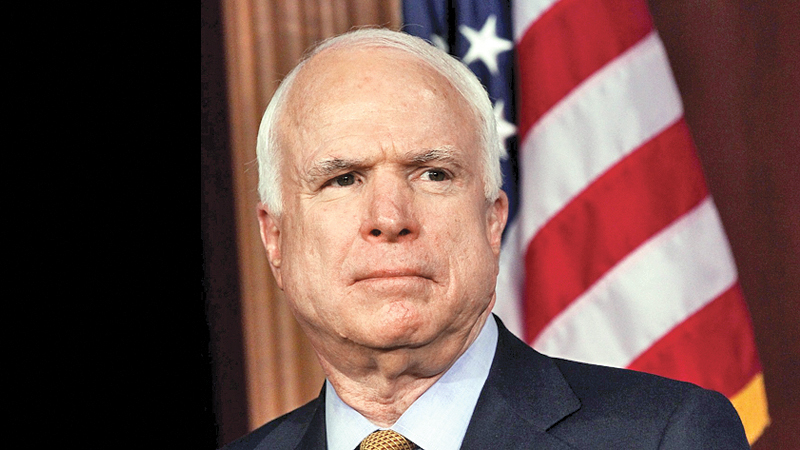 Over the following six years,McCain was held as a Prisoner-Of-War, often being tortured and sustaining injuries that left him with life-long physical disabilities.